Matthew Apgar - mapgar@shawmedia.com Soap suds slide down the license plate of a vehicle during a free car wash at Sharp Auto Body on Saturday, June 13, 2015 in Island Lake. Customers who donated food items to the Wauconda Island Lake Food Pantry were treated with free car washes. For more photos, see the photogallery online at www.nwherald.com. Matthew Apgar - mapgar@shawmedia.com Dalton Atwater of McHenry, 14, left, and Nick Lathan of Wauconda, 17, back, wash a car for free at Sharp Auto Body on Saturday, June 13, 2015 in Island Lake. 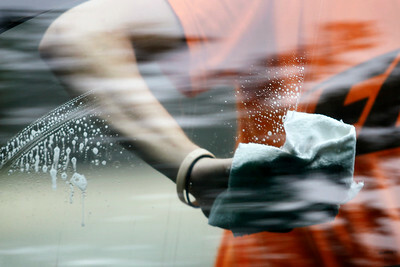 Customers who brought food donations for the Wauconda Island Lake Food Pantry were treated with free car washes on Saturday. For more photos, see the photogallery online at www.nwherald.com. Matthew Apgar - mapgar@shawmedia.com Cody Powers of Island Lake, 17, dries a customer's car during a free car wash at Sharp Auto Body on Saturday, June 13, 2015 in Island Lake. Customers were treated to the free car washes with food donations for the Wauconda Island Lake Food Pantry. For more photos, see the photogallery online at www.nwherald.com. Matthew Apgar - mapgar@shawmedia.com Dalton Atwater of McHenry, 14, dries a car at Sharp Auto Body on Saturday, June 13, 2015 in Island Lake. Customers who brought food donations for the Wauconda Island Lake Food Pantry were treated with free car washes on Saturday. For more photos, see the photogallery online at www.nwherald.com. 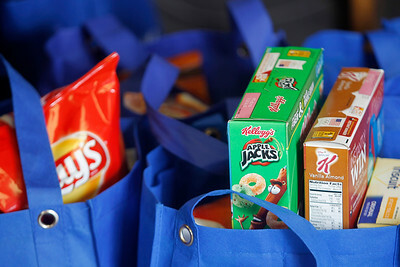 Matthew Apgar - mapgar@shawmedia.com Customers were treated to a free car wash at Sharp Auto Body with the donation of food items for the Wauconda Island Lake Food Pantry on Saturday, June 13, 2015 in Island Lake. For more photos, see the photogallery online at www.nwherald.com. Matthew Apgar - mapgar@shawmedia.com Cody Powers of Island Lake, 17, dries a car at Sharp Auto Body on Saturday, June 13, 2015 in Island Lake. Customers who brought food donations for the Wauconda Island Lake Food Pantry were treated with free car washes on Saturday. For more photos, see the photogallery online at www.nwherald.com. Matthew Apgar - mapgar@shawmedia.com Nick Lathan of Wauconda, 17, washes a car at Sharp Auto Body on Saturday, June 13, 2015 in Island Lake. Customers who brought food donations for the Wauconda Island Lake Food Pantry were treated with free car washes on Saturday. For more photos, see the photogallery online at www.nwherald.com. 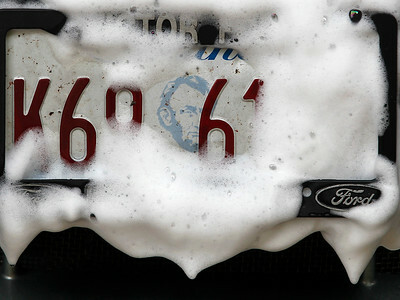 Soap suds slide down the license plate of a vehicle during a free car wash at Sharp Auto Body on Saturday, June 13, 2015 in Island Lake. Customers who donated food items to the Wauconda Island Lake Food Pantry were treated with free car washes. For more photos, see the photogallery online at http://www.nwherald.com.